The 37th annual Race to Beat Cancer will take place in North Conway on Sunday, February 9th at Cranmore Mountain Resort. Whether you are a recreational skier, a snowboarder, a downhill racer, a tubing enthusiast, or just want to help in the fight against cancer, you can join this meaningful and exciting event. Registration begins at 8:30 a.m. at the Main Base Lodge and the race begins at 10:00 a.m. Your minimum contribution of $75 ($50 for those 17 and under) includes a full-day lift or 2 hour tubing pass, organic, locally sourced pizza courtesy of Flatbread Company and coffee from Good Vibes Coffee Roasters. Participants are encouraged to collect donations from their friends, family, and colleagues. By raising funds to beat cancer, you may walk away with a Cranmore Mountain Resort 2013-2014 season pass as one of the top fundraisers. Remember, each donation takes us one step closer to the day when cancer is no longer a life-threatening disease. Funds raised from the Hope on the Slopes Race to Beat Cancer are utilized by the American Cancer Society to fund the most promising research; to spread lifesaving cancer awareness messages; to advocate for screening opportunities for all people; and to ease the cancer burden for people facing this arduous disease. To register and for more information please go to www.cancer.org/racetobeatcancer or call Kathy Metz, of the American Cancer Society at 603-356-3719 or Kathy.metz@cancer.org or (800) ACS-2345. The annual Great Penguin Race was back at Cranmore supporting a new local charity, the Pediatric Neurotransmitter Disease Association. The association had been hard at work selling the penguins every chance they had, near and far. Participants were able to purchase penguins the day of the event as well. This year the PND Association included a silent auction, and Ski with PND as well. The Silent Auction was held on the third floor featuring autographed athlete photographs, gift cards and more. Skiers and riders were able to purchase lift tickets through the organization as well, and all funds were donated to PND. The Drew family generously donated their time and efforts to make today possible in association with Cranmore. They sold 216 penguins to race down the mountain, and raised almost $2,000 through lift tickets. The Silent Auction is still happening as I write this, and will continue until 3:00pm today. It was amazing to see a local family pool together with the community to raise money for such an amazing cause. Stay tuned for next year's event as it can only continue to grow! Happy New Year everyone! What goals have you set for yourself for the year of 2014? If trying something new is on your list, we have the perfect opportunity for you with January as National Learn to Ski and Ride month. We invite you to join us January 11, 2014 for the official launch of Terrain Based Learning and our redesigned learning area. In celebration of this new teaching method, the first 100 children and young teens at each resort enrolled in the KidsRule Mountain Camps will receive a free helmet. 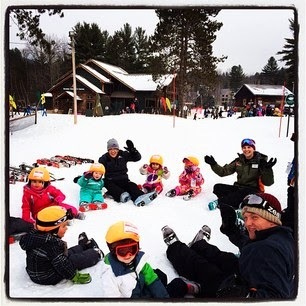 Our learning area brings the fun back into learning to ski or ride, and is a controlled learning environment for beginning skiers and riders that builds confidence and encourages fun and success. humps, mini half pipes, banked turns, berms and spines. This is a great opportunity for first time skiers and riders, no matter your age. Take advantage of the new year and new experiences to come. 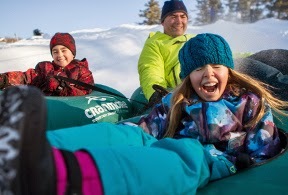 Visit cranmore.com for more information regarding lessons; KidsRule and GET(Guaranteed Easy Turns) and the specials we are offering.